Appearance: An aged man around his early fifties, Gene Kahn, aka the Mandarin, is of Chinese & Arabian decadence, & his clothing justifies that. He wears an immensely long, green robe over himself with many intricate designs that appear to be Chinese such as dragon designs, while wearing a camouflage military pants & boots as well. Most likely from Iraq or at that part of the Arabian land. At his age, he has a large, greyish beard & has little hair on his head. He also has hassle eyes. As the leader of the organization called "The Ten Rings", he bares ten decorative rings upon each of his fingers to establish his hierarchy amongst the ranks. Personality: A secretive man who keeps a low profile in his operations, the Mandarin is considered by many to be virtually untouchable. His is extremely intelligent, crafty, sly & a sinister man. Many call him a terrorist, but Kahn calls himself a "teacher." That he is to be the one to guide people to what he considers the truth. 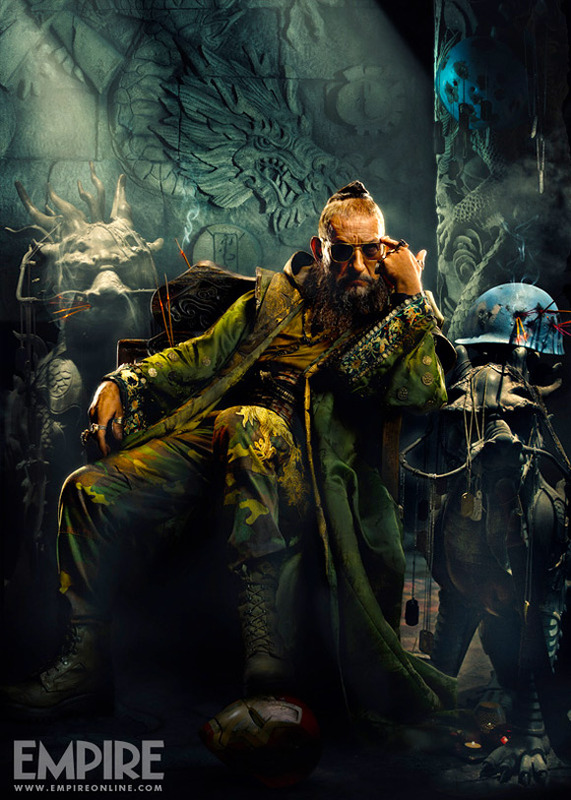 This characteristic has ultimately given the Mandarin an egotistical nature. But he also carries a crafty, manipulative nature. Capable of turning many situations into his favor & turn the world as we know it completely upside down. Furthermore, he does not believe in heroes. & that they are merely foolish people who risk their lives for a cause not worth fighting for. Profession: Leader of the terrotist organization- "The Ten Rings"
Biography: Born in China & raised in Arabia, young Gene Kahn was born into a world of chaos & anarchy. Both his mother & father were thieves & lived off the richest they found from their thievery. He was taught that the world was sometimes cruel to those who deserved to be more then what they were. To people who deserved to lead. Kahn always remembered that life lesson & thus, he set off from that moment to do just that. Years after his mother & father passed away due to poor conditions, Kahn set off to make the world into the image of his own design. A world in which the powerful & the worthy would no longer need to seek refuge from those who intend to be powerful. Within the years & before the war in Afghanistan, Kahn became part of a weapon's dealing group & sold highly powerful weapons over the black market. Yet even when the weapons dealers were discovered, Kahn was successful in covering his tracks & escaping the scenes. From that point, & after the events of 9/11, Kahn knew what he was destined to become. His people had made their mark on the world....& it was time to make his own. During the war in Iraq, he began to create his own organization. One known as "The Ten Rings." As the head master & leader of the bane, Kahn began to spread his terror across Arabia to begin making his mark on the world. His actions eventually caught the attention of many world countries including America. The organization was known for it's ruthlessness & it's very secretive leader, Kahn himself, as he was just as ruthless himself. Yet this entire time, he considered himself a "teacher" among human beings. He would construct organized attacks & plan devious schemes against his enemies. In fact, it was his organization who was directly responsible for the attack & kidnapping of Anthony Stark, the CEO of Stark Industries. Kahn considered Stark to be JUST like himself & that he was no different from what he was- A murderer! An man capable of such destruction with all his weapons technology. When Stark escaped his clutches, however, Kahn sought to break the man & to show the world what he REALLY was. Ever since, the evil man went under a new name in his position in the organization. & now calls himself- "The Mandarin." Now, The Mandarin seeks to make the world's nations into his own image. To show the world just what it really is & turn reality as we know it on it's head. Though a new possibility has come to the Mandarin's attention. & that something is the JFC tournaments. With the arrival of dinosaurs, the Mandarin now seeks to increase the strength of his organization & himself. He has been fighting for four years under an anonymous name & has trained his lethal dinosaurs to their prime. Now, the Mandarin seeks to not only make things into his image.....But to crush Anthony Stark in the palm of his hand!